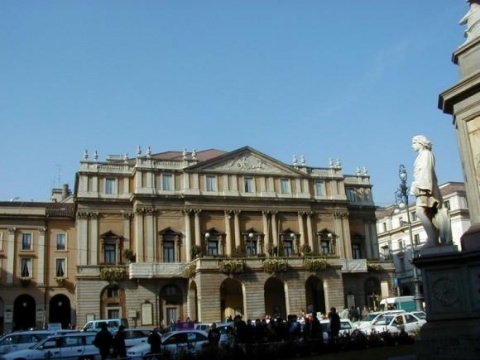 How did you learn about the opportunity to apply for a scholarship to further your education in opera singing in Italy? I learned about the opportunity to apply for a scholarship of the Italian Cultural Institute in Sofia from friends of mine. Then I did a thorough research over the Internet at the Institute's address and on the site of the Ministry of Education. Way back in my last years at the Music Academy in Sofia I wanted to specialize in Italy considering the dominant role it plays in the world of opera! When did you discover you were gifted with a voice you have to develop? solf?ge at the preschool classes of the Sofia Music School. My parents are musicians and for me this has always been the most natural thing in the world! Then came an aptitude for languages and literature, but that deep-rooted attachment to music was never broken! I gave up the violin to replace it with a guitar. The opera voice, on the other hand, ripens later, but I have always cherished love for singing, for the opera art and not only just for music! Maybe when I was 17-18 years old I started dreaming of becoming a singer! I tried some simple exercises at home and warming up with vocal scales. I also took lessons with several voice teachers. Where did you start your education? What is the special line of your training? My regular education in opera singing started about a year before applying to the Music Academy in Sofia. I met my future Maestro, the baritone Niko Isakov who was warmly recommended by a lot of people! We got down to work and I took lessons in parallel with finishing high school (the Spanish Language School Miguel de Cervantes). How does your education at Accademia del Teatro alla Scala di Milano (Conservatorio G. Rossini in Pesaro) add to your background? The State Conservatory Gioachino Rossini in Pesaro is a new level in my professional training as an opera singer. I have not come here like some kind of freshman making first steps in the art of opera, but as a young artist with university background in vocal art and six years of continual hard work of study and practice in the profession. I am happy with this course of events in my life! This is a place of very high standards! The differences are obvious! But this is far from enough! Italy is the place where you can see that other and different attitude to the music phrase, to the energy of the text, clear articulation, to the dynamic turns of music and style features expressed by various composers and composer schools. In this respect I think that the Academy in Sofia provides a really solid base serving as background and foundation to focus with confidence on the other things that make music especially beautiful and turn your eyes to the genuine dimensions of art! Meeting Italian conductors, Italian vocal coach-accompanists, vocal teachers and singers is so important and rewarding! The help of these people in building up the complete image of an accomplished professional opera singer is most valuable! Could you analyze the specific benefits of the Italian contribution to your training? The specific thing about the course I'm following here at the State Conservatory in Pesaro, even though it's a two-year program, is that it is extremely wide-ranging! It does not focus only on singing and acting – just as a really good opera singer should not be well-versed only about his own voice and his talent to move well and command the stage. The singer is a very complex personality; he is an actor, musician, and sometimes a professional liar! He should be able to hold the audience, dominate on the stage, communicate with his colleagues, follow the music and the mise-en-scene the director has staged, breathe in unison with the conductor's baton, "get into character", or, as we often like to say, live your role on stage and put your heart and sole in what you are doing...and that's the only way to light that hidden fire exciting the people at the theater hall! To achieve all that requires solid training! A soldier should learn how to shoot before going to war, shouldn't he? And he must also know how to survive! For us, the singers, things are not different! One needs long hours of individual work, one has to spare much time for learning various music subjects adding to their knowledge and feeling for harmony and for beautiful and sublime! The curriculum in Pesaro has been organized to suit precisely this purpose. There are various theoretical subjects of extreme importance in shaping the artist as a professional musician, though they might seem far from the essence of singing! The program contains piano lectures, solf?ge, harmony, theory of music, history of art, lectures on specific music trends through the centuries, on different periods and composer schools, on the diverse styles as distinguishing features of musical compositions, courses on listening techniques and memorizing music skills (which is very useful for people expected to have 30-40 opera titles in their head in the years to come!)... There are also other subjects having a direct bearing on singing – Italian diction, chamber music, choral singing, acting, and working with a voice-coach accompanist... And, of course, the special subject – singing with a teacher. In the Internet era, what is the role of traditional schools, as the one in Pesaro, in the education of an opera singer? The art of opera is very old, it has lived through various crises and years of absolute misery and I think it will survive in the Internet Era as well! Actually, Internet could be a great advantage! Now, in the era of communications, performances and music compositions are within easy reach. Very often they place cameras in big theaters (as in La Scala, for instance) and with the help of Internet and TV, people can watch live grand season openings or an attractive and worthy opera performance from any point in the world! All it takes is a computer or a TV set! Besides, Internet is overflowing with old recordings of opera performances from long ago and brilliant accomplishments of great opera singers that are no longer alive. It is so exciting to be able to listen to their captivating voices, feel their style and learn more about their vocal technique! High communication technologies do not have and have never had direct bearing on the process of education in vocal art and they are so far apart. Lately we have been hearing about lecturers delivering classes via the widely popular communication program Skype. My personal opinion is that this is not serious! Nothing, even most high-tech options, can replace the power and importance of the personal contact between the Maestro in vocal art and his student. The spiritual relationship established in their personal contact is so intimate and so special that it can hardly be exposed on the Internet. Concerts, recitals and operas are played on stages, no matter if big or small, but everywhere in the world teaching rooms are small and cozy to allow close physical contact so that Maestro and student could join their efforts in the shared cause of passing on the vocal art "into the throat" of one more new artist. Opera singing is not just an occupation, it is a passion. How do you intend to use the skills and competences you have acquired when you come back to Bulgaria? Bulgaria now faces tough reforms in the cultural sphere! I think the policy of neglecting the spiritual needs of the individual demonstrates deliberate humiliation of the human being, turning it into an obedient appliance ready to get up in the morning and go to work! If we can say that culture is the herald of intellectual emotions (and that's absolutely true), then culture improves the way of life. To destroy it would mean to destroy the tiny hope for sensing beauty and harmony... So, no matter how advanced our life might be from the point of view of technology, it would remain low and primitive! I believe that if there is a tide of artists, young people with good education obtained abroad to sweep over the several opera theaters in Bulgaria, the result will be very encouraging! Now opera posters feature about a dozen names touring the whole country and singing practically everywhere! Should other names come to the fore, names of quality people chosen to pursue their studies in elite universities in Italy, for example, the situation would be quite different! Young people have always been in the lead of change heralding new developments and prospects! Could you describe in brief how the Italian school has influenced Bulgaria in the field of opera music and illustrate it by the portrait of a famous artist with a background close to yours, who has had outstanding professional accomplishments in Italy? Bulgarian opera singers are famous all over the world. There was a golden generation, but unfortunately, most of them are not alive. They are followed by a new addition of talented singers, young artists educated in Bulgaria conquering the world opera arenas! There are plenty of examples – the baritones Vladimir Stoyanov and Ventsislav Anastassov, the bass singers Yulian Konstantinov, Orlin Anastassov, Dian Vatchkov, the mezzo-sopranos Mariana Pencheva and Vesselina Katsarova, the sopranos Vesselina Vassileva and Tsvetelina Vassileva, the tenors Lachezar Pruvchev and Boyko Tsvetanov... They are all the product of the Bulgarian vocal art school with additional training in Italy. Now they are solo singers in big opera theatres in Italy, Spain, Austria, Germany, France and the USA. I am also proud to mention the name of my singing teacher in Pesaro, the Bulgarian mezzo-soprano Evgenia Dundekova. After she graduated from the conservatory in Sofia, she went to be trained in Italy. She followed a five-year program in Pesaro where she also started her career as a singer! The vocal art school in Bulgaria is a remarkable start serving as the foundation for cultivating a quality product – an accomplished opera artist and singer.